Warwick Daily News chief-of-staff Casandra Garvey is visiting her parents in Ayr, smack in the middle of the area expected to be worst hit by Cyclone Yasi. This is her diary of Cyclone Yasi. 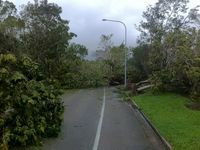 DRIVING through town today when we were safe to venture out of our homes, Yasi's path of destruction was plain to see. Massive trees had been ripped from the ground, leaving expensive structural damage to the bitumen or pavement which cracked and broke as they broke free. Shadecloths across car parks and schools were torn to shreds and powerlines had been brought down by big trees and roads closed. Dad arrived in town this morning, appearing at the doorway and asking where his chainsaw was. After tucking into a bacon and egg burger cooked on the gas barbecue he headed back down to Groper Creek to cut up some trees which had fallen across the area. He also played wildlife carer with three Tawny Frogmouths which were sitting on the ground shaking after their horrendous night. They're now in good hands with the proper care, but after the shock Dad's not too sure if they'll survive. The next hurdle North Queensland has to face before the cyclone clean-up can begin is the rising floodwaters from the heavy rainfall. Roads are cutting extremely fast and the next question for me is if I'll ever get out of Ayr to reach the Townsville airport to fly back to Brisbane once planes are back in the air. They're expecting a "major flood" and the potential to be stuck for a good couple of weeks is becoming very real...anyone flying in by helicopter want another passenger? Let me know! I WON'T have another night like last night in a while, with Cyclone Yasi keeping the family awake most of the night. The night was long, with the wind absolutely roaring, crashing into the sides of the house and shaking the windows. So far this morning there have been no reports of injuries or fatalities, but it is still too early for us to appreciate the full extent of the cyclone's damage. Everyone has been urged to stay inside and still wait until the destructive winds pass, which are still blowing around the 100kmh mark. The trees outside are still shaking and rain is blowing hard against the windows, with the sky still a dark grey and power in the house still off. Mum and I had a quick venture outside to see a large sheet of iron loose on the backyard shed but other than that we can't see too much damage to the house. I was happy to pick up my phone this morning to see Dad calling - the power is still out down at Groper Creek and all he could say was "what a night!" He said a lot of water had come into the house and heaps of trees had come down but he made it through without a scratch so that's all I care about! Yasi will continue to produce damaging wind gusts and heavy rain as it moves further west and begins to weaken. THINGS have certainly intensified during the past half an hour, with the wind picking up - they're saying it should reach speeds of about 200kmh, which doesn't sound good. Cyclone Yasi at midnight was in the process of crossing the Queensland coast, which was smack bang in line with the Bureau's predictions. My family in town are right now trying to get some sleep but I'm wide awake and probably will be all night as the wind stays intense. It's too hot to sleep anyway, with the power still off and only one window in the house open to allow the wind to pass through. The wind still has that howling sound to it, but it has gotten louder as each hour passes. They've once again warned residents of the strong tidal surge expected during the night an into the morning, and I just hope my dad makes it through unscathed down at the creek. I haven't heard from him in about an hour and probably won't until the morning as the landline might be cut an there's no mobile phone reception down there. The last thing he commented about was the increased intensity of the roaring wind which was shaking the hut, as it is also doing to our house in town. I've also been keeping in touch with my cousins in Townsville and Cairns who are also going through this terrifying cyclone. Some of my cousins in Townsville have bunkered down in their bathroom with their little daughter who's not yet one, who's one of the few lucky enough not to remember this scary day. For those old enough to comprehend what it will mean for North Queensland in the days, weeks and months to come it's something we won't forget in this lifetime. WE'RE now just two hours away from feeling the most intense force of Cyclone Yasi as it crosses the North Queensland coast and I'm still not sure how much more of this I can take. As I said in my earlier entries, I'm not in the direct "eye" of the cyclone so I hate to contemplate what our northern neighbors are about to experience. Again, the thing that is the most scary about this whole experience is waiting - and we have been, for hours. My dad phoned in half an hour ago to say things were getting scarier down at the creek hut, which was shaking, with water beginning to creep closer towards the house. The scariest part for him, being right on the creek, is this storm surge the authorities keep talking about and the potential for two of these surges. That means a lot of water and depending on how high it rises could mean he could be having to climb on top of the roof to escape the water - and with highly destructive winds still expected into the early hours tomorrow could mean big trouble. All we can do here is keep safe with the knowledge he has been through a few cyclones before and knows what to do. The wind is still blowing strong here in Ayr and some friends have reported power being out, with ours luckily still on for the moment. I'll try and post more in the coming ours, but the potential for communication towers being damaged may not allow this. Again to all my North Queensland folk, please stay safe - we'll get through this, we're bred tough up here! * Sent from my iPhone - power has just gone out. POWER has now come back on, but with the wind and rain steadily increasing with every minute that passes, we're not sure how long it will last. The worst of the cyclone is now meant to hit about midnight, two hours later than earlier predicted, which still means a long night ahead. Luckily, we've been able to contact my dad who's waiting it out at Groper Creek - 10km south of Home Hill - and the rain was loud in the background. "We're getting absolutely lashed," he said, "it's bucketing down - very heavy rain". Of course after the cyclone has passed, the floods the region endured at Christmas will once again be felt. Then there is the inevitable clean-up - with trees smashing down on one vehicle earlier today I cannot imagine what the streets will look like when the storm has passed and it's safe to venture out and inspect the damage. Cyclone Yasi seems to still be tracking towards Innisfail, a town which of course suffered the brunt of Cyclone Larry five years ago. But what I've learned these past couple of months with the floods in Warwick and again up here in North Queensland is that Mother Nature doesn't care if you've gone through a natural disaster - she definitely doesn't discriminate and there's no stopping her. To keep track of Cyclone Yasi's progress click HERE. AFTER being without power for one hour and as the night gets darker and darker, the howling wind is an indication this night is going to be a long one. Advice we have heard constantly during the past few days is once the destructive wind kicks in to shelter you and your family in the smallest room in the house. Advice also suggests a room with no windows. The house we're in has windows in every room, so we have pit a mattress down in a 2m section of hallway, with thick doors around us. Batteries are in the radio (but we're only turning it on every hour to hear the latest bulletin to conserve battery), torches are within reach and the front door is open to allow the house to "breathe" with the wind coming from behind us. We don't have a bathtub to follow Anna's advice to fill it up in case the water is shut off, but we have filled all the bottles we can in case that happens. So for now we've all done everything we can by following the experts' advice so all that's left to do is sit tight and wait it out. THE day so far has been a tiresome one - and the cyclone hasn't even hit yet! I spent the morning at the meeting of the Local Disaster Management Group meeting in the Burdekin Shire Council chambers, where all emergency, community and council services staff were delivering the latest reports. The latest news is that Category 5 Cyclone Yasi is still tracking south, which puts us in its path before it reaches landfall. The officials are still expecting it to cross around Innisfail at midnight, but as I've said before cyclones are unpredictable and it could cross north or south and earlier or later than predicted. It's very much a waiting game, with almost everyone I spoke to today simply shrugging their shoulders and saying "we just don't know". The main concern I have right now though is for my dad, who has decided to wait it out at Groper Creek while the rest of us are in town at Ayr. He's one of 18 residents down there who have decided to stay, wanting to secure their own homes and make sure the cyclone doesn't cause too much damage. "I've been through a cyclone before," he told me, "I know what to do". But there are many people who don't know what to do or to expect - me included - and are feeling bloody scared as this thing moves closer. We had about 10 minutes of strong wind and rain about 11am, which was enough to bring down a huge tree on to a resident's ute in the same street as my brother and sister's place. "And the cyclone hasn't even hit yet," one resident said, laughing with a slight hint of fear in her voice. But that's the kind of attitude I'm finding people have up here - they have a "ah well, only in North Queensland!" kind of attitude, like it's to be expected. And on the one hand it is, but with the Bureau saying a cyclone of this intensity won't be experienced again in this generation, you have to think it's not just another thunderstorm. My thoughts are with everyone going through this cyclone - please stay safe and remember once the first lot of wind and rain passes, DON'T go outside as the eye of the storm is expected to last for an hour or more, with more destructive wind and rain to follow. AS we all slept peacefully in our beds last night, Cyclone Yasi built up steam and my wake-up call this morning was the siren sound of the latest Cyclone Bulletin - a sound I'll probably still hear for months after the event. Yasi is now a Category 5 cyclone and the warning issued by the Bureau is enough to make anyone sick to their stomach. "SEVERE TC YASI IS A LARGE AND VERY POWERFUL TROPICAL CYCLONE AND POSES AN EXTREMELY SERIOUS THREAT TO LIFE AND PROPERTY WITHIN THE WARNING AREA, ESPECIALLY BETWEEN PORT DOUGLAS AND TOWNSVILLE. The Cyclone has now reached CATEGORY 5 and will continue to move in a west-southwesterly direction during today." As the system is still moving south-west, it means we in the Burdekin are still very much under threat, with the Disaster Management Group meeting this morning at 9 to determine exactly which areas will need to be evacuated. Shops in the main Ayr CBD are expected to close by lunchtime today as the wind picks up and the stormy conditions start. Whichever area cops the most fierce part of this cyclone will face unbelievable damage, with wind gusts at the centre of Yasi already at 295kmh. The bit I'm most dreading during this dangerous cyclone is the fact it's going to hit in the middle of night. This thing is going to cut power, bringing down trees across powerlines, which means we're going to have to face this in pitch-black conditions, with only the light of a few torches and candles. My cousin lives in Cairns and said his wake-up call was a recorded message urging him to get out so our whole family will be affected no matter where Yasi hits. 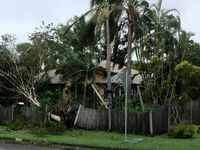 THE situation in the Burdekin, North Queensland has not changed too much since this morning, with residents still on high alert as Cyclone Yasi moves closer. Residents were somewhat relieved when they heard the cyclone was more poised to cross the coast at Cairns - not good for the Far North Queensland town but at least it is looking like we won't feel the immediate brunt of Yasi. But, as Premier Anna Bligh has been urging residents to understand, cyclones are unpredictable. They can change direction, intensify or dissipate like a click of the fingers and a whole other town can be in its path - so I am well aware we're not out of the woods just yet. Down town people are still panic buying - though I use the term "panic" loosely, as residents are simply doing what they have been asked to do, which is stock up on the essentials so their families are well prepared. Signs have gone up on shop windows in the main street of Ayr informing customers they have closed or will close early tomorrow because of Cyclone Yasi and the main thing I am seeing being advertised is generators for sale at all the hardware shops. Another observation from doing the trips back and forth between Ayr and Groper Creek moving my parents' possessions was the increase in traffic heading south. It seems everyone is bailing from the north and are either heading south (which would take them awhile to be out of the cyclone's path with the watch still current down to Yeppoon) or heading as far west as possible. After being dark and gloomy this morning, it disappeared and by lunchtime the North Queensland heat was back - I have the sunburn to prove it. The impending cyclone did not deter a handful of fishermen down at Groper Creek, who cast out their lines as Barramundi season opened at midday (myself included). While no barra were caught - some locals quipped even they had escaped inland - we all enjoyed what was sure to be the last day of sunshine we'll see for a while, with flooding rain predicted once the cyclone has hit land. The latest I'm hearing is the authorities will have a better picture of the cyclone's path by 10am tomorrow, where they should be able to determine with more accuracy where it will make landfall. THE sky over the North Queensland town of Ayr has turned a dark grey colour, matching the mood of everyone awaiting the arrival of Tropical Cyclone Yasi, which is currently a Category 3 cyclone travelling towards the North Queensland coast at 40kmh. Where my parents live at Groper Creek, 10km south of Home Hill, police doorknocked residents yesterday to tell them we needed to evacuate by 10am tomorrow. So this morning was spent packing up our belongings - mine was easy as everything was already in my suitcase - and tying down everything that could be tied down. The locals were already out and about talking about the evacuation and where exactly they could evacuate to, with the owners of the caravan park heading as far west as they could to Mount Isa to escape their first cyclone. Down town the mood is as dark as the sky - panic buying started with the formation of Cyclone Anthony, which hit Bowen (about an hour and a half south of where we are) on Sunday night. We hadn't until this morning been able to get our hands on a loaf of bread, and even then it was one of the last remaining loaves at 8am. There are many folk in Ayr who have been through this before - they know how to prepare for a cyclone and what to expect, which not too many residents can say. My dad said to me this morning: "all you can do is pack up what you can, tie down what you can and then pour yourself a scotch and ride it out - what more can you do?" The scariest bit, so I've been told, is the noise of the cyclone once it's here. "You won't hear anything louder," one old mate at Groper Creek told me this morning. "It's like the cyclone is trying to knock down everything in its path and is yelling and carrying on as loud as it can because it wants to knock down more." Giving an almost-human element to this massive twisting ball of wind and rain was somewhat terrifying. I'm not sure why it's so ticked off but I just hope it calms down a bit before it hits the coast. According to the local disaster management group which is meeting as I type, it's not likely to, though. It was expected to reach a Category 4 cyclone at 10am this morning and stay that way or maybe intensify into a 5 by the time it hits us. This means we can expect winds of up to or even more than 200kmh, which is serious business. But for the moment, all we can do now is wait and see what happens, listen to the Bureau of Meteorology bulletins and advice issued by emergency services and hope everyone stays safe. Keep an eye on this page for updates as Cyclone Yasi moves closer.